A picnic cheese board can be a thing of extraordinary beauty. Perfect for today’s obsession with taking a picture of any, and everything, we eat. If I asked you to come up with 5 essential picnic foods it would be my guess that cheese would feature heavily amongst your answers. What is it that we find so utterly delicious about cheese? Furthermore, how can we expand our love of cheese to make it all the more enthralling? Well, I suppose the first question is rather subjective, I can, however, throw some light on the second. Allow me to take you through, as best I know how, a whistle-stop tour of picnic cheese board ideas. Let me show you the tools of the trade, speak of possible dangers facing your cheese course and hopefully leave you knowing a little more than you did before reading this article. Before we start we should probably be aware of the different kinds of cheese that will be talked about in this article. I have listed four main categories although you may hear of more. I will tailor my list specifically for a picnic cheese board. So I have omitted classifications such as fresh cheeses which would include cottage cheese for example. Soft cheese – These include cheese such as Brie, Camembert, and Gorgonzola. They are generally spreadable cheeses with moisture content around 50-80%. The shelf life of these cheeses is normally some of the lowest. 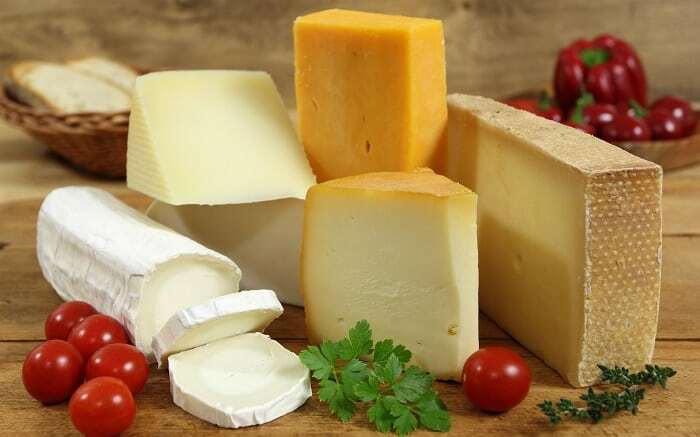 Semi-hard cheese – These include staples such as cheddar, Edam and Gruyere. They do not retain as much moisture as semi-soft cheese with it being typically around 36-40%. These cheeses can start off as mild flavored but if left can become a lot more mature in both taste and texture. Hard Cheese – These are the cheeses that have been left to mature the longest. They are generally pungent of smell and crumbly of texture due to moisture contents of around 30%. They include Parmesan, Pecorino Romano, and the utterly delicious Manchego. 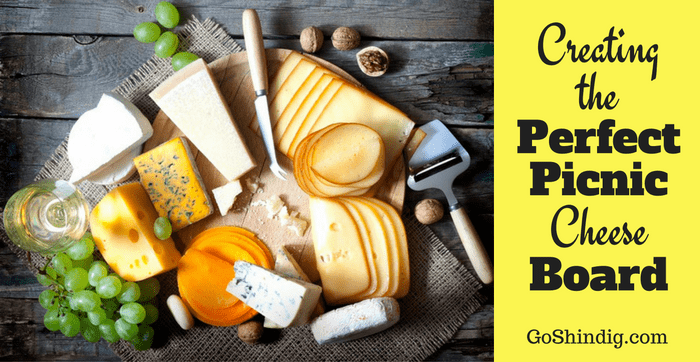 So we now know what kind of cheese we can expect to see on our picnic cheese board, let’s start putting together a set of items that can deliver the best experience for you. And where else should we start other than the board itself? It will not surprise you to hear that a picnic cheese board comes in all shapes and sizes, each with their own good and bad points. From wood to slate, and from open to domed there are a plethora of options available to you so please read on for some handy suggestions. Your classic looking cheese board. Wooden cheese boards have been the mainstay in society since time began. And who wouldn’t want to have a wedge of Stilton perched on a lump of wood? It just looks so right. There are one or two issues that you must be aware of before deciding on a wood board. The type of wood used is important as it can play a massive part in flavor absorption. Along with natural scratching of the surface from knives the board, if made from porous woods, will act like a giant sponge and take in amongst other things bacteria. To counteract this we suggest buying a board from a non-porous wood like Maple. The other issue concerning wooden boards is cleaning and maintenance. Now you own a non-porous wooden board you think you’re good, right? Well, unfortunately, wooden boards are not dishwasher safe meaning extra time and effort must be taken to keep them in prime condition. This is achieved by waxing or oiling your board regularly. A weekly covering with mineral or coconut oil is the most popular way to do this. This board from Truffle Toast Home showcases everything a good wooden board should be. Made from Italian Olive wood it showcases a great design resembling a cleaver. It’s a perfect size for your picnic basket and best of all it comes as a set of two. If you’re thinking of a romantic picnic with your loved one then this cheese board from Baking Time Club may be just the thing for you. 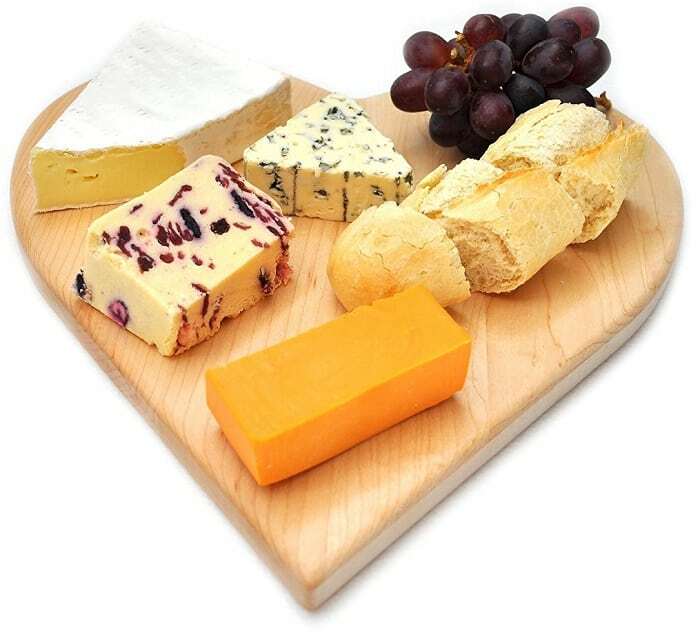 Set in the shape of a heart and made with non-porous American Maple wood, this cheese board will also fit nicely into your picnic basket measuring 12” x 12”. Slate and particularly slate boards encapsulate everything that is meant by being modern. You cannot escape them if you visit a modern restaurant where your steak and mash will be nestled picturesquely on top. For true dining experiences such as these slate seems to be more of a fad, mainly due to it not being very practical. Juices tend to leak from your meal and pool all over the tablecloth. The same argument cannot be levied at slate cheese boards, however. There are no great amounts of juice that are coming from the cheese so the risk of spillage is virtually zero. Another quality slate boards can boast about is their lack of porosity. Place as much stinky cheese onto your slate picnic cheese board as you like without fear of it soaking in the flavors. To clean the slate, all you have to do is give it a quick wipe down with warm water. Some treatment with food grade mineral oil may be required but is not essential. Slate can scratch fairly easily, however. Not so much an issue if all you are using the board is to lop a piece of Brie off but it should be stated none the less in case you were thinking of using the board for multi-functions. Cheaper boards have sometimes been reported to be brittle as well but I’m sure you would need to be dropping the board from a great height onto the sidewalk for that to happen and that doesn’t sound much like a picnic to me. What slate cheese boards do have going for them is practicality and aesthetics. No one can deny how beautiful looking a slate picnic cheese board is to gaze upon. Mainly because all slate boards are black slate which really accentuates the colors of anything presented on it. It’s also extremely easy to store in your picnic basket due to its size and it is generally a cheaper option. This Slate cheese board by J.K. Adams ticks all the boxes for your picnic needs. Made from slate quarried in New England this board comes with all the natural roughness you’d expect from a piece of rock. Measuring 16” x 12” and weighing in at just 1 pound this board is an absolute bargain price. Picnic hall-of-famers Picnic at Ascot’s Slate cheese board comes with an added bonus of handles. This makes moving your cheese board around your picnic blanket a breeze. 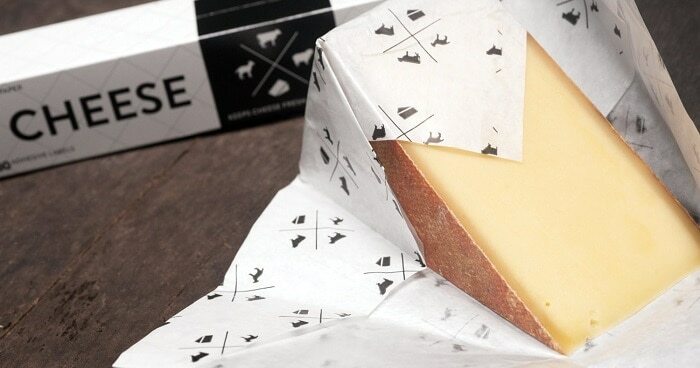 You will also receive 2 pieces of soapstone chalk so you can have a little fun with labeling your cheese. Marble, on the face of it, seems an ideal material to make a picnic cheese board out of. And there are definitely arguments for and against this statement. Firstly it is widely known that the surface temperature of marble will be less than that of its slate and wooden counterparts. That’s a good thing according to many as it will keep your cheese nice and cool. And for our benefit, using them in a picnic setting, this holds true. The last thing you would want to be doing is leaving cheese out in the sun, raising its temperature. I will go on to talk about cheese storage and serving recommendations later but suffice to say hot, sweaty cheese is not good cheese. We are aiming to get cheese served as close to room temperature as possible and marble cheese boards, in a picnic setting, can aid in this. However, like wooden boards, marble can be very porous. They can also be extremely heavy when measured against its rivals. This deters from their practicality. So time and effort are required if you are to own a marble board. To maintain the board I would suggest following the instructions provided here. Boards like this from RSVP make all the time and effort well worth it, however. Visually stunning and just the right size at 10.1” width, this round cheese board is also relatively light coming in at 3.5 pounds. The Norpro Glass Cheese Dome offers something different as it comes with a dome. A dome in a picnic setting is a great thing to have. Most importantly, it forms a barrier between your sometimes stinky cheese and bugs that the smell can attract. As this dome sits on marble it allows the cheese to keep cooler. Thus, it aids in a better tasting snack. A cheese knife is no ordinary run of the mill knife. You might think just because it has a blade on it I can use any knife I want. And that’s true for the most part. But when you’re struggling to cut through an Emmental with your dull-edged dinner knife you will wish you had invested some time into learning which knife best suited your needs. There are a plethora of cheese knives available and although four or five will more than likely suffice, we are here to present to you all available options. Fork-tipped spear – The most popular cheese knife. It has 2 prongs coming from the end that can be used for stabbing chunks of cheese. Open work blade knife – An essential tool in your cheese knife arsenal. Distinguishable by the holes that run through its blade, this knife allows you to cut through soft cheese like Brie without it sticking. Spade – This small, stocky knife is used for cutting into the hard cheeses such as Parmesan and making wedges. It also has a point that is suitable for stabbing at cheese and bringing it to the mouth. Gorgonzola knife – This is a spreading knife made for soft and blue cheeses. Resembling a palette knife, it possesses a sharp blade which can also be used for cutting. Flat cheese knife – A much wider looking chisel, the use of this cheese knife is for portioning soft cheese. Its height allows you to get on top of the cheese and cut straight portions. You can also use it to shave bits from harder cheese. Narrow plane knife – A slimmed down version of the flat cheese knife used mainly for semi-hard cheeses. Soft cheese knife – Used exclusively as a spreading knife its thick blade allows you to scoop up a lot of soft cheese and spread it on your bread or crackers. Buying a set of knives often cuts down on expense and worry as you know sets will cater for every possible need you may face. The Vinkesso 5 piece cheese knives set is such an example. Extremely stylish looking set with a knife for every occasion. Made from stainless steel you can cut, slice or spread away to your heart’s content. The 3 piece set from Victorinox can only be described as quality. You are perhaps short of a spreader but hopefully, a normal knife would suffice in the circumstances. Composing a fork-tipped spear, an open work blade knife and a spade this set will tackle the vast majority of cheese you would care to throw at it. Cheese slicers are a handy addition to your picnic basket. They are the perfect tool to shave or cut slices off on site, ensuring maximum freshness of your cheese. There are a few styles of slicer each catering to different needs. The hand plane slicer is a tool that is best suited to shaving cheese if that is what you so require. Especially suited to hard cheeses but the hand plane slicer is equally at home shaving softer varieties. Cut size is generally a couple of inches so it makes it an ideal taste test tool. At no more than 12 inches it will easily fit into your picnic basket as well. The adjustable thickness slicer is quite a self-explanatory item. Used in much the same way as the hand plane, the slicer has the added benefit of being fully customizable to suit your needs. With the aid of stainless steel wire cuts you can slice cheese up to ¼” thick and 3.5″ wide. Perfect for a picnic sandwich. Finally, if you’re serious about cutting yourself a hunger-busting chunk of cheese that a knife, no matter how good, is going to struggle with then you need a cheese board slicer. Feel like you are in your own personal deli where you can cut as much out of that block of cheese as you want. OK, we’re pushing it a bit here. We know that the main function of a girolle is to show off at dinner parties. But in the interest of thoroughness, we felt it would not hurt to add a little section. Girolles are used primarily to shave the top from cheese wheels. They do this by having a spindle about which turns a sharp blade which is manually turned. The effect of this is to produce flowers of razor-thin cheese that can be gobbled up at the soonest possible moment. As it’s always the top of the cheese wheel you are cutting from you are always tasting the most aged bit from the block and so savoring the best the cheese has to offer. We now have a good grasp on the tools of the trade. We have decided which board best suits our needs and decided which knives, slicers and girolles if any, we need. So now we need to figure out what should actually be put onto our cheese board? This is a good question as we are talking specifically about a picnic cheese board. This means the rules that apply at dinner parties don’t necessarily apply here as well. What I think we can all agree on though is that variety is definitely the spice of life. The perfect picnic cheese board is a varied one. This means a cheese from each of the main categories; soft, semi-soft, semi-hard and hard. This can also apply to the source of milk meaning you could have cow, goat or sheep milk. No matter the size of your picnic party, four or five different cheeses are ample enough to satisfy even the cheesiest of cheese fans. As a rough guide, you should be aiming to serve around 4oz of cheese per person. 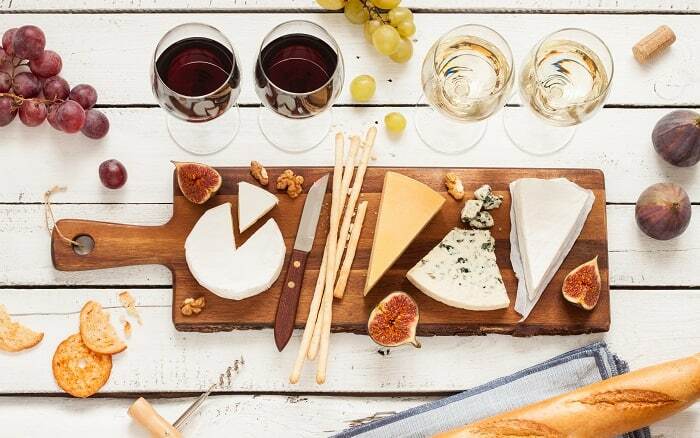 It is not recommended to overcrowd your picnic cheese board, as flavors could start to become mixed with cheeses that are in close proximity with each other. Making sure your cheese board is suitably large enough is something that then must be taken into consideration. Leaving a couple of inches between your cheeses would seem a good enough gap. 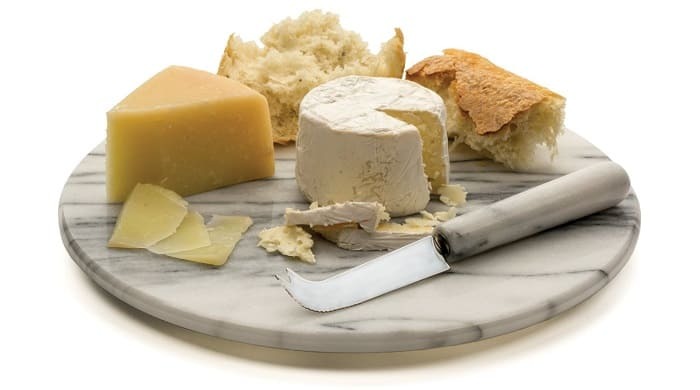 On the same note, and only if budget permits, you should think about having separate knives for each of your cheese selections to ward off any possible flavor transference between cheeses. Sometimes you crave that extra layer of texture whilst sampling all your beautiful cheese. As well as having properties that are naturally filling, breads and crackers fulfill this need for texture. Again, there are no hard and fast rules as everyone’s tastes are different but we suggest sticking to breads that are fairly neutral in terms of flavor. The baguette is about as neutral as you can get but it is by far my favorite accompaniment to a chunk of cheese. Breads containing olives or walnuts suit many kinds of cheese, just try to stay away from anything too herby as the flavor may overpower the star of the show, your cheese. The same kind of rules apply for your crackers as well although I must admit being a bit more adventurous when I make my selections. Water crackers/biscuits pair nicely with almost any cheese you can throw at them whilst some multigrain crackers offer more texture with a different flavor sensation. I also love crackers that are topped with salt though this is easy enough to do yourself. If you can I suggest investing in Jacobs biscuit for cheese selection. They are by far the best set of crackers I use for my cheeses, with the digestives particularly delicious. The picnic cheese board isn’t solely there for carrying cheese. There are a lot of extras that we can pair your cheese with that encompass all tastes. From fruits to meats to veg, the choices are plentiful. So please have a little read and see if you can pick up a little inspiration. Fruits – There’s just something about cheese paired with fruit isn’t there? The two contrasting flavors of salty cheese and sweet fruit on our taste buds seem to lead us on a merry dance. Figs, grapes, apples all regularly appear on cheese boards but you could also add peach, raisins, and pears. As long as the fruit is not acidic like oranges or lemons you should be able to find a home for most fruits on your picnic cheese board. Typical Pairings – Brie and Cranberry. Melon and Goats cheese. Apple and Cream cheese. Pears and Stilton. Peaches and Feta. Grapes and Gorgonzola. Meats – Cured meats and cheese that are paired together can produce some of the most amazing flavors you are likely to find. On the face of it, they shouldn’t really work with each other as they share quite a few characteristics. For example, they are both rich in protein and both have the salty taste that we love to crave. Finding a cured meat and cheese partnership, however, is relatively easy. Typical pairings – Salami and Mozzarella. Pastrami and Monterey Jack. Parma ham and Parmesan. Chorizo and Manchego. Condiments – Using the definition of the word in its loosest sense, condiments bring a great deal to the party when it comes to your picnic cheese board. All manner of flavor combinations work well from sweet to sour and salt to vinegar, and condiments encompass the whole spectrum. Honey keeps up with the sweet and salty dichotomy that forms a great marriage with cheese. As it is so sweet, it’s best to pair honey with the stronger cheeses like your Gorgonzolas and Stiltons. Balsamic Vinegar is towards the other side of the taste scale with it being considered an extremely sharp taste. It pairs well with more mature hard cheeses like Pecorino. In the same breath, you can also include pickles due to their vinegar content. Mustard, although sometimes overpowering, can offer a sense of heat that compliments some cheese. I would invest in some nice English mustard and pair it with a mature cheddar. As discussed in our types of cheese section towards the top all cheese is full of moisture. It’s this moisture content that defines the cheese’s properties. The more moisture in the cheese the softer it will be. And this is important to remember because the less moisture in the cheese the harder it will become and if you have purchased a semi-soft cheese that is not a good thing. So how do we go about keeping moisture at optimum levels for our picnic? In general terms, it starts with your fridge. You have probably noticed that if you leave a piece of cheese in your fridge uncovered it will become dry and inedible. This is because the fridge takes away all humidity from the cheese and no humidity means no moisture that your cheese thrives on. So covering your cheese solves the problem, right? Not entirely. The cheese needs to be able to breathe. Just by covering it you could be suffocating the cheese. All that you end up with then is a clammy, sweaty cheese that is no good. However, wrapping it in cheese wrapping paper allows the cheese to breathe. Picnic time, so how are we going to make sure the cheese arrives in tip-top condition? Luckily for us, it’s best to eat cheese at room temperature. So for your picnic, we recommend to refrigerate until just before you set off if it’s a hot day. This increases to an hour or so before you leave if it’s just mild weather. 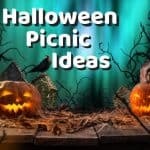 Store your cheese in a tub big enough that it won’t suffocate and if needs be try to regulate the temperature by placing it in your picnic basket with an ice pack at the bottom. So there we are. We hope we have given you more than a few ideas for you to enjoy your picnic cheese board. There are a lot of options out there but the best cheese boards in my eyes are the simplest ones. If you’re fretting over this or that it won’t translate into a good day out so sit back, relax and enjoy your perfect picnic with your perfect picnic cheese board. I was salivating the whole time while reading that. I can’t express how much I love a cheese platter. Great tips on the sides, however I don’t see my favorite item. Onion chutney everyone! Put that on your cheese platter and you’ll not be disappointed.